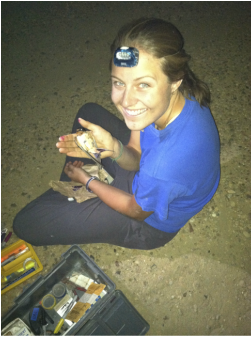 My research focuses on determining causes of variation in sexually selected traits, and understanding the consequences of this variation for population divergence and speciation. In my doctoral work, I studied how inter- and intrasexual selection interact with environmental variability to drive divergence and generate prezygotic reproductive barriers in the greenish warbler (Phylloscopus trochiloides) ring species complex of Central Asia. At the University of Colorado, I am working on the genomics of population divergence in the barn swallow (Hirundo rustica) complex. This widespread species has recently diverged into several subspecies that differ in plumage phenotype and migratory patterns, yet remain apparent ecological equivalents. Using a combination of intensive fieldwork, quantitative genetics, and next-gen sequencing, we are assessing the relative contributions of divergent natural and sexual selection (i.e. isolation by adaptation) vs. isolation by distance to both phenotypic and genomic divergence in this group. On a large scale I am interested in how new species form and in the underlying causes of diversity. In particular, my research focuses on how sexual selection and parasites could be mediating speciation across closely related populations. I am hoping to better understand how coevolution between hosts and local populations of parasites could act as a selective force to create reproductive barriers. Using three different barn swallow subspecies with divergent sexual selection, I am studying what information different sexual signals are giving to females about parasites, immune systems, and nest environments. In order to look at what females gain by choosing attractive mates and how this could be changing across populations, I am looking across a wide range of avian parasites and immune measures, as well as performing field experiments (cross-foster). Initial data suggests that the expression of different sexual traits links with parasite loads on males in at least two subspecies- suggesting that these traits could be advertising information about parasite resistance, and that this is changing across subspecies. Amanda is currently a postdoctoral fellow at the University of Minnesota. Kyle completed an honor's thesis in our lab group on fine-scale nest movement decisions of barn swallows. He stayed on to do exceptionally well in the BA-MA program and completed his MA in spring 2016. 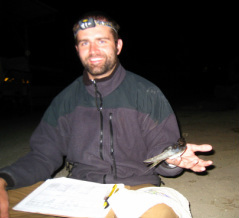 For his MA degree, Kyle studied the role of predation and parasites on nest site selection patterns of barn swallows. Read Kyle's recent publication here. Iris was awarded a National Science Foundation Postdoctoral Research Fellowship,﻿ Intersections of Biology, Mathematics, Physical Science and Engineering to work on social networks. The goal of my postdoctoral research is to understand the interface between social behavior, physiology and parasite transmission by testing hypotheses that integrate themes from evolutionary biology, behavioral ecology and wildlife epidemiology, within the mathematical framework of social network theory. There are gaps in our knowledge of social transactions related to the difficulty obtaining accurate measures of social interactions, the lack of experimentation within social networks, and the analytical challenges associated with robust statistical comparisons of networks. We are currently working with Dr. John Burt, who develops﻿ Encounternet digital transceiver tags for obtaining social contact data, and Dr. Juan Restrepo, an applied mathematician who specializes in network dynamics. Iris is currently an Assistant Professor of Biology at Agnes Scott College. I am broadly interested in the evolution and maintenance of of sexual signals. More specifically, I am interested in understanding the proximate and ultimate mechanisms that control plumage color in birds. My dissertation research focuses on understanding the color variation seen within and between subspecies of barn swallows. I am using a quantitative genetics approach to understand the roles that genes and environment play in the development of phenotypic variation. Preliminary results suggest that both genes and environment are significant sources of phenotypic variation and I am currently working to isolate the effect of each individually. I am also using a candidate gene approach to explore allelic variation in known vertebrate pigmentation genes between phenotypically divergent populations. By using a comparative framework, I hope to provide a better understanding of how variable selection on ventral plumage color between populations has contributed to population divergence in the barn swallow species complex. Joey recently moved to Truman State University where she is an Assistant Professor of Biology. Broadly, my research interests lie in understanding the origins of diversity. My doctoral thesis examined why organisms often grow at submaximal rates, despite the known advantages of large body size and rapid development times. Ongoing research looks at the factors that maintain genetic diversity in traits under selection, including environmental variation and genic capture. At the University of Colorado Boulder, I am studying the role of sexual selection in the among-population diversification of the black scavenger fly Sepsis punctum. Populations of this geographically widespread species vary dramatically in the magnitude and direction of sexual size dimorphism, as well as in mating behavior. The relative roles of sexual and ecological selection in promoting reproductive isolation remain controversial: by observing mating behavior within and among populations, I can assess the role of sexual conflict and female preferences in driving reproductive isolation of ecologically similar species. 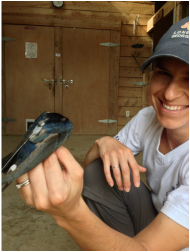 Matt completed his PhD, entitled "Evolutionary divergence in sexual signals: insights from within and among barn swallow populations." After working as a postdoctoral fellow at the University of Nebraska-Lincoln, with Drs. Dai Shizuka and Eileen Hebets, Matt is now working on Science Communication as a fellow at Vanderbilt University. Find out more about Matt's terrific research and science communication work here. Yoni completed his PhD at Tel-Aviv University and is co-advised by Dr. Arnon Lotem and Rebecca Safran. Yoni is currently an Assistant Professor of Biology at Tel-Hai College, Israel. I am interested in the evolutionary forces driving the endless variation in nature. Specifically I am interested in cases where selection on the individual, such as mate choice and sexual selection, and population level forces, such as gene flow and genetic drift, interact. Yoni is now an Assistant Professor at Tel-Hai College, Israel. Read more about Yoni here. I am interested in how small-scale interactions can determine broad-scale species patterns and change; how mate-choice can shape population divergence, or how individual experiences produce patterns of age-related reproduction. For my honor and master’s theses, I have focused on how life history patterns of age-related reproductive performance are played out in an individual’s lifetime by studying the relative influence of different factors on reproductive success each year. I’m most excited about the physiological processes underlying sexually-selected traits. More specifically, I am investigating the relationship between the stress hormone corticosterone (CORT) and the sexually selected melanin-based plumage color of male North American barn swallows. CORT is important in initiating the stress response, which is aimed at increasing immediate survival when an individual is faced with a challenge (e.g. presence of a predator, competitive interactions). Therefore, it may play a crucial role in shaping behavior essential to survival and reproduction, and plumage color could signal to potential mates a male’s ability to cope with stressors. I am also looking at the potential for selection to shape individual variation in the stress response. Natural populations of avian species are highly variable in both baseline and stress-induced CORT concentrations, which is shown to be correlated with different measures of fitness. Part of my thesis research aims to elucidate the heritability of CORT, as well as the relationships of CORT profiles with reproductive success and survivorship. As of fall 2015, Brittany is a PhD student at Montana State University. Maren worked on various questions related to the dynamic interactions between physiology, morphology and behavior with a focus on stress hormones and life history variation. 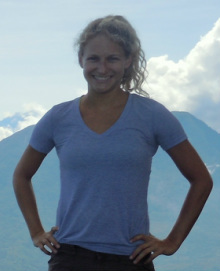 Maren is currently an Assistant Professor in the Department of Ecology and Evolutionary Biology at Cornell University. Read more about Maren's work here. Roi was a postdoctoral researcher in our group from summer 2011 through summer 2012. Roi is currently an Assistant Professor at Tel-Aviv University. Read more about Roi's work here.